Are you guys ready for THE LIST? We have rounded the corner in the Wardrobe From Scratch Series, inching closer to the personalized case studies and tailored lists to help you build a wardrobe. Before we get to that, Part 4 of the WFS Series is a template of a very, very generalized list to get you started. I’ve said before that I am not about the lists of “essentials” or “must haves” for every woman. I have my personal must-haves that fit my lifestyle and style, but I’m not about to tell you that every single one of you needs them too. Some of you chase kids all day and don’t need pencil skirts. Some of you need those pencil skirts for your office. Some of you don’t even like skirts! Hopefully you did your homework from Parts 1 and 2 and have identified your style and lifestyle needs and have chosen your neutrals and color palette. You’re gonna need it to use this list well! It’s like a starter kit. This is NOT meant to be an exhaustive list that will fill out your entire wardrobe. I kept it very minimal so that you could focus and not get overwhelmed. Starting from scratch is overwhelming! This list is meant to serve as a solid foundation for you that should allow you to build a great mix-and-match wardrobe that serves you well. Like a starter kit, get it? You decide the specifics of each piece. As you can see, it’s very general. The intent is for you to decide what cut or silhouette or style or functionality you want to fill in for each piece and to build a wardrobe in a way that suits YOU. Like, if the list says “neutral colored skirt” you can decide if a pencil skirt or an a-line skirt will be more useful to you, based on what you identified in Part 1 with your lifestyle and style. It doesn’t have to be rigid. If you are not a skirt wearer, then ignore the skirt stuff! Swap it out for another pair of pants! Of course I’d encourage you to at least try owning one skirt or a dress or whatever else you have sworn off, but if you are dead sure that you’d never wear those things or that you can’t or don’t need that many of that category, then swap it out. Make the list your own! Real Life Example. If you want to see how this list played out in real life, check out the two posts for Hannah’s makeover: Hannah’s Shopping Guide and Hannah’s Outfits. And remember, I’m also going to use this list to make specific lists tailored for each of the upcoming case studies! Okay, seriously, if you haven’t done the work of Part 1 and Part 2 of this series, then you’d better get to it before you get your hands on this list! Otherwise you’ll be trying to fill in the pieces kind of blindly and I don’t want you ending up with an uncoordinated wardrobe! I really hesitated to put any sort of visual examples in this post because I didn’t want to limit you to styles that might not fit you. But then I thought you might actually benefit from a range of examples to help jog your mind about what cuts and prints are possible. I put together some examples for pants, skirts, and dresses. Completer pieces and tops are available in plenty, so you should have no problem finding those. Links for where to buy the items shown are available below each photo. They are all from Target or Old Navy. Many of the Target options are available in regular, petite, and plus sizes! Also, most of the Target items come in LOTS of different colors that are NOT featured here. If you like an item but wish it were in a different color, check and see what else is available! Quick reminders: 1) Fit is key. 2) Keep in mind what to look for when shopping for remixable pieces. 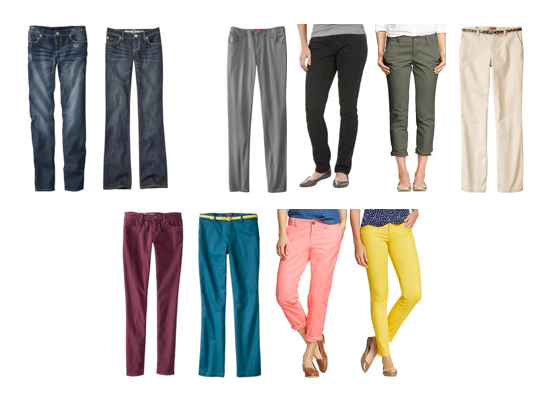 Everyday jeans in a medium or dark wash. Whether skinny jeans, straight legged jeans, or boot cut or trouser jeans, or whatever, make sure you’ve got a pair for the “everyday.” Go for a medium or dark wash as it’s more flattering and can transcend different scenarios better. A pair of dark washed straight legged pants can be great for everyday but can also be dressed up. It’s harder to dress up lighter washed jeans. Pair of neutral colored pants. Khakis, cargo pants, trousers, cigarette pants, whatever! There’s a bunch of options above. These can also be utility, everyday type pants, but a different color and possibly a different material besides denim will bring a lot of versatility. Pair of pants in another neutral or from your color palette if you’re brave. You know how I feel about colored bottoms. But you can do another neutral pair if colored bottoms aren’t your thing. Maroon is a safe step away from a neutral if you’re trying to be brave but aren’t quite there yet. If maroon is too dark for your color palette, try salmon! Believe it or not, those salmon cropped pants above go with a lot and aren’t too scary. Neutral colored skirt. Pencil, a-line, hi-low, maxi. Pick whatever fits your lifestyle in a neutral colorSkirt in your color palette. Maybe even another, too! All of those skirts above are from Target and each come in a VAST array of colors. 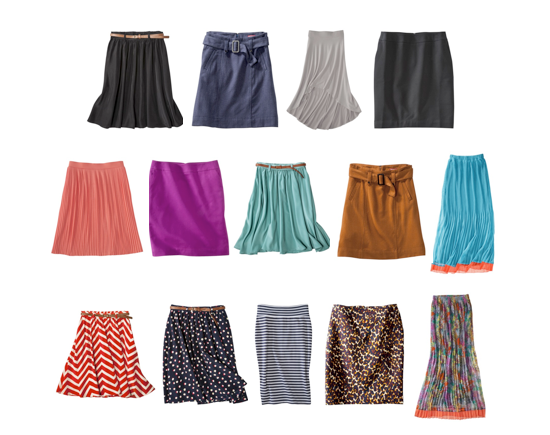 1-2 printed skirts within your color palette. Patterned skirts can be hard to find. In addition to the Target ones above, ModCloth has a ton of great ones. 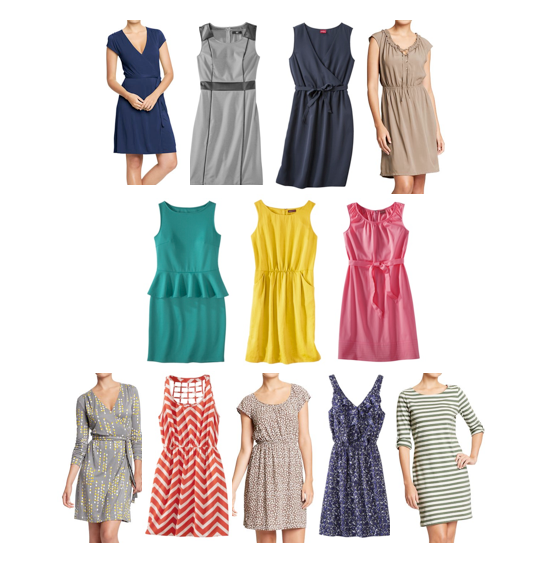 Ideally at least one of these dresses should be wearable for parties and baby/bridal showers, and the more remixable it is the better. If you can wear it with a denim jacket and flats or with jewelry and heels, it’s probably a winner. The rest of the dresses should be for your everyday wear, whether your needs are for the office or for the playground, unless you regularly have parties or showers to go to. Being that I don’t need dresses for the office, all of my dresses can actually be worn to showers and casually. Just saying it’s possible! Solid dress in neutral; second solid dress in either neutral or color; 1-2 printed dresses in color. I encourage more printed dresses rather than solids because printed ones can often be worn with lots of different colored completer pieces, especially a print like dress #4, the navy one in the bottom row. You can wear it with black navy, mustard, or pick out the purples and teals in it. Completer pieces are things like blazers, cardigans, cropped jackets, etc. Basically things that layer over your shirt or dress. I’d encourage you to change it up, opting for a mix of different kinds of completer pieces. 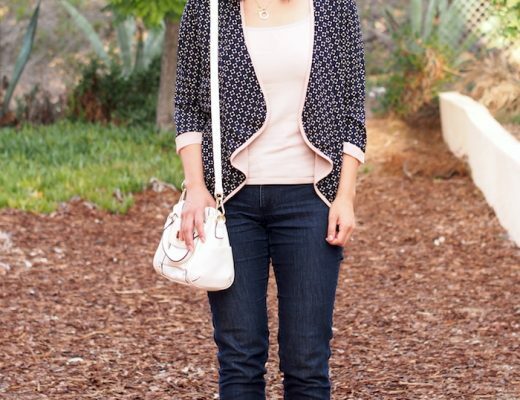 However, if you really don’t like blazers or cropped jackets, four cardigans will be fine too. Target and Old Navy have lots of blazers, jackets, and cardigans. Tops can get crazy. There are so many types to choose from! T-shirts, button ups, plaid, utility blouses, dolman shirts, sweaters. It’s nuts, which is why I didn’t show any shopping options! However, having defined your style and lifestyle should help you focus on what kinds of tops you’ll make use of. In my experience skirts are harder to find than completer pieces and tops. I suggest nailing down your pants, skirts, and dresses in colors and patterns before looking for completer pieces and tops. Once you land on those, then look for completer pieces and tops that will go with them. Okay, that was kind of crazy. Take some time to fill out specific types of items for your list. If you get stuck, don’t worry–the case studies are coming soon! If you would like further help creating a list of more specific items for YOU, check out Cladwell’s capsule wardrobe creator HERE. Find my in-depth post about Cladwell HERE. Win $30 to Origami Owl from Samantha Landay! What a great post. While I have way too many clothes, it has given me new ideas of what I am missing and how they could be worked together. Can't wait for the case studies! I love your blog and have been following this series religiously. Will you do a piece about accessories? How many to buy and what as a starting guideline? Keep up the great work!! Honestly, you are incredible! This is such awesome, solid advice and information! The make up of a perfect closet can be so relative and subjective, but you made it very easy for someone to customize this to their needs! I have a question about the seasonal aspect of this. I know you don't have to worry about it getting too cold in Cali but here in Idaho we have quite varied seasons! For some of this stuff it doesn't make much difference but for skirts and dresses I wear very different versions of them in the winter versus the summer (e.g. sweater dress vs. a sun dress). Is it better to make the wardrobe starter kit thinking about just one or two seasons (spring-summer maybe) and then build more to vary by season eventually, or better to try to find stuff that would work any time of year? Thanks, I love your blog! I used to live in Idaho (Moscow), and now live in Maryland. Talk about a climate difference! Hopefully Audrey will address your concern, too, but I thought I'd throw in my two cents. Since these are pieces for a starter wardrobe, I'd suggest getting the items she suggested but maybe in more neutral colors. Think outside the box, too! A cobalt blue cotton skirt would look just as seasonally appropriate in the spring with a yellow cardigan as it would in the fall with some warm cashmere. Remember that layering is important, too. A skirt can take you from summer to winter if you just add some warm tights, and the same with a neutral dress. Pencil skirts look great on my body shape, but I'm a stay at home mom with 3 little boys. I've found that by picking a more casual fabric (like a stretchy print or a recent Old Navy purchase of a bright green cord pencil skirt) I can still wear a flattering shape without looking like I'm going to the office. Your blog has been so helpful as I've recently had a baby and moved to a new climate–serious wardrobe challenges! Thanks for all the great info. I love your blog! Can you post some more about jewelry and other completer pieces? I feel like I do OK with the basics, but I can't ever figure out how to wear different necklaces or bracelets and what they pair well with. I feel like I put them on and then take them off again because I'm too timid to try it out – some tips on how to pick out the right jewelry would be awesome! Great advice! I love this post! Thank you so much for sharing. posts. In any case I ωill be subscгibing to your feed and I hope you ωгite agаin ѕoon! Hi Tabbi! I love everything that Ashley said about keeping in mind that this is just a starter wardrobe that is meant to be added onto as well as learning to use pieces in more versatile ways through layering. I would recommend doing BOTH of what you said–find pieces for the current season AND as many thins as you can that can be worn in a couple of different seasons. I believe that most pieces can be worn in at least two season, like a sweater dress with tights and boots and other layers in the winter, but maybe with bare legs and less layers in the fall. Or a sun dress by itself in the summer, with a cardigan or light jacket in the spring, and with tights, boots, a cardigan, and a scarf, and maybe a shirt underneath in even colder weather. Thanks for the help Ashley and glad you can relate having lived in Moscow (I'm in Boise so it doesn't get quite as cold here but this winter has been particularly frigid!). I'll try to take your advice when I go shopping today and look for some bright colors that will work in any season! 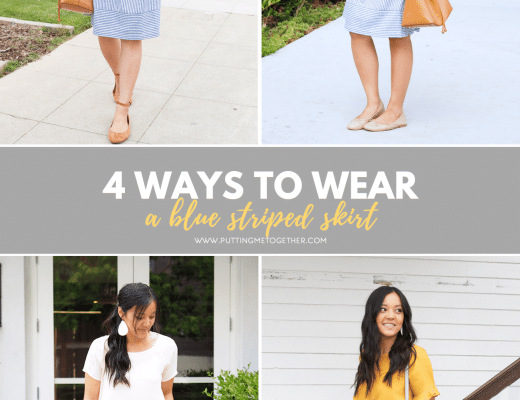 I definitely need more solid color casual skirts in my life – I always gravitate toward them in my closet, but for some reason avoid them when shopping! Great post that I will keep coming back to again, and again! I haven't braved the wardrobe revamp yet, but this list is amazing! Prefect for getting me started. I need to go through the steps and make my list so that when I am out window shopping, i will know it if I spot a needed item. Thanks for doing all the tough work so that we can do the easier parts of making it fit us! You are awesome! And I always love your outfits! Thanks for the tips! Love this blog!! Having trouble finding my style at 39. I stay at home and work 2 mornings a week t a preschool so not sure how to dress!! How do I get over the attitude of "why should I waste a good outfit I'm not going anywhere !" I end up in sweats because I go nowhere except running kids to swim practice etc!! Help!! Do you own all the items pictured in this post? If so, can you show some outfits using the skirt in the bottom row #2? Ok I've purchased the pieces and I love your look but I can't seem to combine my clothes or see how they will combine as well as you do. Any suggestions? I am really loving this series! Thanks so much for all the hard work you've put into it. This was my favorite post yet! And I love that you put in the pictures, it was really helpful to me to see, "Oh, that's what she means by a neutral skirt…" etc. I have a closet full of clothes and "nothing" to wear, and I always feel so ungrateful for that attitude. With your tips, I plan on starting over and only sticking to pieces that I love. Thanks again, you ROCK! I just have to say – I found this blog on Pinterest and I dove in way more than I expected! Your outfits are so lovely, and you REALLY know what you're talking about! I've been sick of my same-old, same-old wardrobe lately (I'm a person who thrives on variety/doesn't like routine) and this blog SERIOUSLY is inspiring me! Thanks so much for sharing your knowledge! P.S. – I LOVE that you're a REAL girl who shops at Target & Old Navy – showing us we can ALL look cute & rock our own beautiful style when most of us real, everyday women shop at those places too 🙂 Rock on! i hope i can take your posts and put them to use for myself.. i am really excited about trying these steps out. I have never really paid attention to my wardrobe and i have lots of pieces in my close i never know what to do with… when i shop i just pick pieces that i like at the moment, then when i get home i "never have anything to wear"
This rocks! I just lost a bunch of weight–baby weight and comfort weight (after marriage)–and have pretty much no clothes and no plan for getting them. This is a great starting point…thanks for doing the legwork for me! Do you have a guide to choosing shoes to match an outfit? (or know a blog that does have a guide?). Im 20 and all my life I have only owned 1 pair of shoes at a time. And they are always the same type of shoe: Asic trainers. After 2 or so years when my pair is so full of holes that I have to buy a new pair I go and get a new pair of asics. I have absolutely no idea what kind of shoes go with what outfits. And thats usually what stops me from buying anything other than jeans and tee-shirts. My trainers just dont go with frilly skirts and skinny pants. Yay, that's great to hear, Alex! Good luck with it! Where have you been all my life? Seriously, since I left high school I have been tying to find a "uniform" because it seemed easier than trying to define a style or to go out into the wide world of shopping unarmed. 20 years and two kids later, these simple and consolidated guidelines have convinced me that I don't need Tim Gunn! I might just be able to pull this off on my own and leave my house looking better than "not too bad". THANK YOU! Haha! I'm really glad to hear that you feel encouraged, Phillicia! Good luck with everything! Thank you! The first really comprehensive list for the truly fashion-fearing person! It's taken me quarter a century to accept that I cannot be trusted to choose outfits-I get the some good bits but my love of a bargain has led me astray too many times. (I am incredibly good at picking out outfits for older women however- this must count as a plus as it will eventually come in handy!) Going to try this out at a cross roads in my life! I'm so glad to hear that! Thanks so much for taking the time to write with encouragement, and good luck with everything! I'm a shorts person like Enjoli98. Where do I add these in? Swap them out for skirts if you don't like skirts! Or if you like pants, skirts, AND shorts, use the descriptions for pants or skirts but apply them to shorts in an additional category. Hi Audrey, I'm just starting the quest to redo my wardrobe. After having kids and no time or money to put into my wardrobe for about 8 years, I'm down to less than the bare basics. I hate clothes shopping at the best of times, but I was beginning to get teary at the thought of having to go out and find so many replacement items. 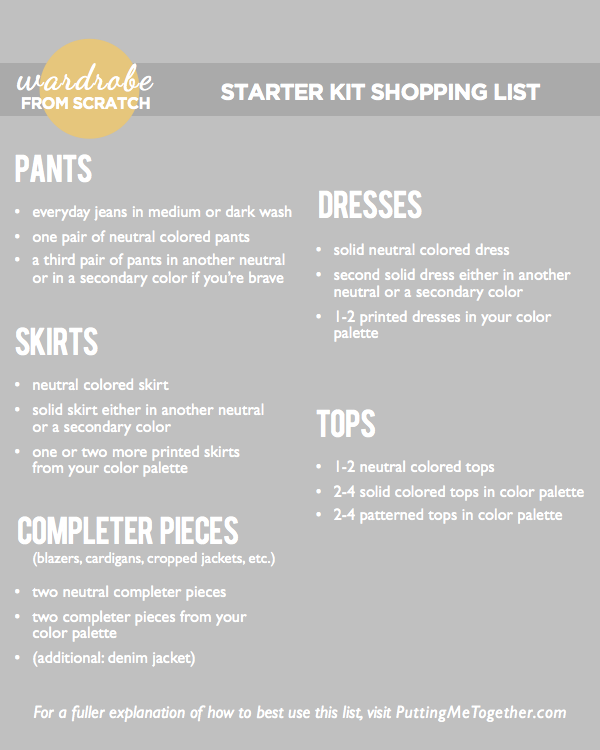 This list and all the complementary information has really helped me get excited about the idea of getting my wardrobe under control. Thanks. This is so encouraging to hear, Eva! I'm so sorry that you were getting teary eyed with the thought of replacing so many items, but I'm REALLY glad that you feel excited and hopeful about redoing your wardrobe now! Thanks for taking the time to write and say hi! Hi Audrey! Thanks for putting this together. I'm actually setting off on the process of losing a lot of weight, and plan to use clothes shoppong as a motivator. This is an excellent resource! I'm planning on culling my closet down to basics now and using your list as a guide as to what to keep while I'm losing. That way I'm not overwhelmed with a closet full of too-big clothes and I can use my clothes-rewards wisely on versatile pieces. Thanks for your guidance! So glad to hear that, Tina! Good luck with everything! Oh my goodness, Pam. This is such a sweet comment to read. I'm so incredibly glad to hear that this was able to relieve some anxiety for you, and I really hope you end up with a wardrobe that you love and makes you feel amazing. Thank you so much for taking the time to write! It made my day! Just what I needed. I am beginning a new career and don't have any business clothes after losing weight. Thank you. I'm a little nervous about that first impression. So glad this could help, Jay! Good luck in your new career! Okay, so I'm finally ready to get my wardrobe into shape. I always love the outfits that you put together and would love to try them, but I live in south Florida. We don't wear long sleeves here. Any thoughts on completer pieces that are not cardigans and blazers? In addition, there are some short sleeved cardigans or very lightweight cardigans. Good luck! Thanks! I forgot you had written that. Can't wait to start shopping! Glad to hear that! If you haven't yet, you can also read the Building a Remixable Wardrobe series which might be better at helping you use what you already have. Good luck! Congrats on your weight loss, and best of luck with building a new wardrobe! I hope you're able to create one that makes you feel amazing! I have a question about use of pattern. I am trying to build a new wardrobe and want to be very intentional with what I am buying so that I can have fewer clothes with more options. I am considering only getting prints in certain pieces to try to have to most remix options. For example, I was thinking everything solids except tops and dresses. That way every top could be worn with every bottom and all the patterned dresses could be worn with any of the solid layering pieces. Maybe I would start to feel rather boring with this approach though. Also, what about accessories? Get them in solids or prints? Do you have any insight on what pieces are best to get in pattern? I personally like to have a mix of solids and prints, but I might do it proportionally with separates and mirror the number of prints to solids on top and bottom. Like, if I had 10 tops and 10 bottoms, I might do 3 *solid* tops and 3 *printed* pants. I'm a little braindead right now (thanks #mombrain) so I'm having a hard time articulating why I'd do it that way, but intuitively it makes sense in my head haha. Sorry! For dresses I prefer more prints than solids. For accessories, again I'm about the mix. However, if you go the route of having ALL of your tops be prints, then it might be better to have more solid accessories. Otherwise it'd be hard to coordinate patterned scarves and shoes with printed tops.